The recently introduced permutation Gene-pool Optimal Mixing Evolutionary Algorithm (GOMEA) has shown to be an effective Model Based Evolutionary Algorithm (MBEA) for permutation problems. 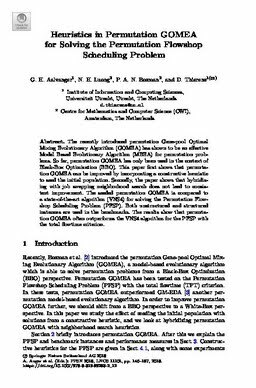 So far, permutation GOMEA has only been used in the context of Black-Box Optimization (BBO). This paper first shows that permutation GOMEA can be improved by incorporating a constructive heuristic to seed the initial population. Secondly, the paper shows that hybridizing with job swapping neighborhood search does not lead to consistent improvement. The seeded permutation GOMEA is compared to a state-of-the-art algorithm (VNS4) for solving the Permutation Flowshop Scheduling Problem (PFSP). Both unstructured and structured instances are used in the benchmarks. The results show that permutation GOMEA often outperforms the VNS4 algorithm for the PFSP with the total flowtime criterion.